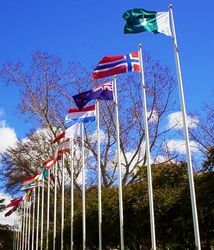 The historical Avenue of Flags, which runs along Centennial Park, was erected in 1959 on the Snowy Mountain Scheme's 10th anniversary, in remembrance of the homelands of the workers involved in the construction of the scheme. It comprises flags from 28 nations which existed at that time, representing the first of 60,000 to 70,000 people from overseas who came to work on the Scheme between 1947-52. Construction of the Snowy Scheme was managed by the Snowy Mountains Hydro-Electric Authority, it officially began on 17 October 1949 and took 25 years, officially completed on 21 October 1972. The Snowy Mountains Hydro-Electric Scheme is by far the largest engineering project ever undertaken in Australia. It is also one of the largest and most complex hydro-electric schemes in the world. The system's construction is seen by many as a defining point in Australia's history, and an important symbol of Australia's identity as an independent, multicultural and resourceful country. The Snowy Scheme is also considered economically important for Australia. It supplies vital water to the farming industries of inland New South Wales and Victoria. The system's power stations also produce up to ten per cent of all electricity needs for New South Wales. THIS RECORDS THE OPENING OF THE THIRD FESTIVAL OF THE SNOWS AND THE UNVEILING OF THE MUSIC SHELL AND MODEL OF THE SNOWY MOUNTAINS AREA BY THE HONOURABLE NELSON LEMMON (COMMONWEALTH MINISTER FOR WORKS AND HOUSING 1946-49) ON 17th OCTOBER 1959. MANY MEN WHO BUILT THE SNOWY MOUNTAINS SCHEME CAME FROM OTHER COUNTRIES. 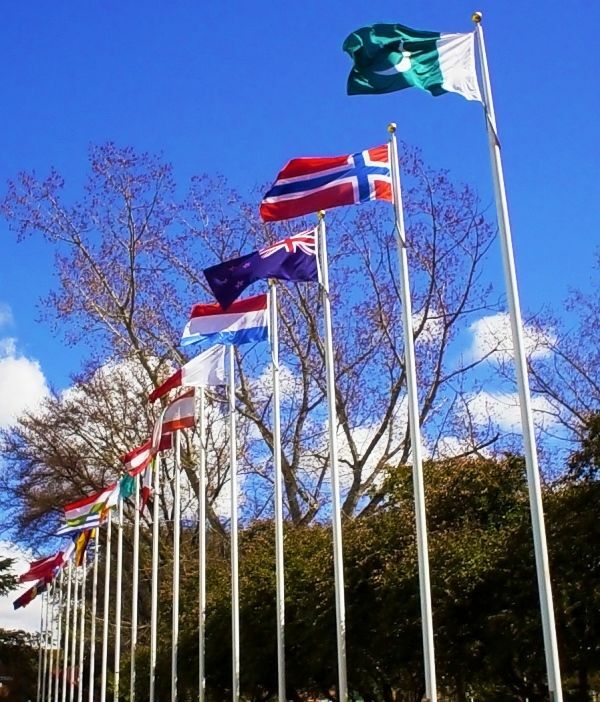 ON THIS DATE, THE TENTH ANNIVERSARY OF THE COMMENCEMENT OF THE SCHEME, FLAGS OF THEIR NATIONS WERE UNFURLED IN REMEMBRANCE OF THEIR BIRTHPLACES, THEIR CULTURE AND THEIR CONTRIBUTION TO AUSTRALIA. FOWELL, MANSFIELD & MACLURCAN - ARCHITECTS.